My brother said I post fewer photos (lol). Daddy said I’m less long-winded and broader in perspective (#liberalarts). And Mommy started crying because God’s unfolding vision for me surpasses anything she ever imagined. That was a wondrous moment. When you love your children so much, it’s a sacrifice to let go and entrust them to the growing pains of the learning process. A bit like seeping an alpine berry teabag from Joe Van Gogh. Tugging the string doesn't steer the bobbing pouch precisely, but no matter its course, we know it will flavor its environment and become part of a yummy, richly colored cup of experience over time. Well, Momma Choo - I’m a teabag. College has indeed drenched and drained me for the better. 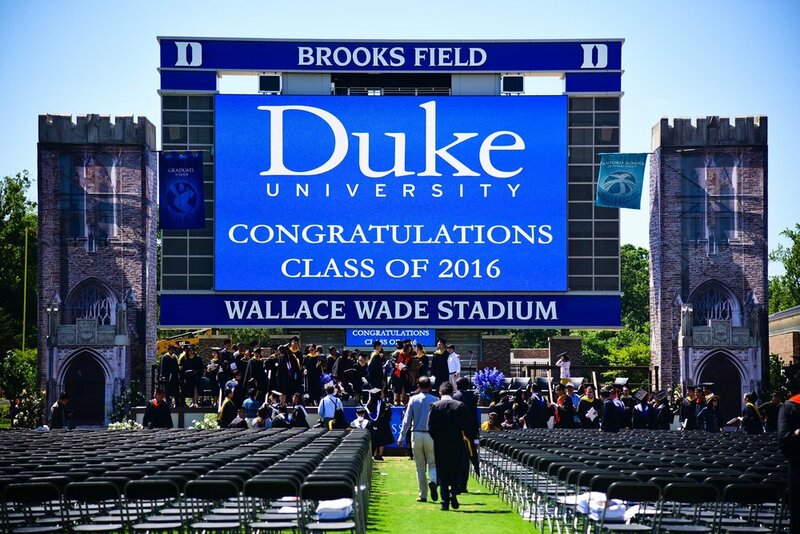 Just as President Brodhead welcomed the Trinity College Class of 2016 to the company of "educated men and women,” my time at Duke has taught me how to learn - anywhere. I know, learning is the least you'd expect to gain from a $250k+ education. But it took me until senior year to really appreciate education as a joyful privilege and formidable force for reconciliation and peacemaking. As an idealistic shutterbug and doodler with an irrepressible reflex to get inside people’s heads, I have always felt at odds with the persistent expectation of neuroscience students to be premed. It required time away from campus - to learn from communities in Colombia and communicators at InterVarsity - for me to reorient my worldview around Story and return motivated to lean in to the tension of understanding everyone's narratives. Including mine - this seemingly fractured mosaic of faith, documentary, neuro, a cappella, education, justice, AAPI heritage, and foodie fusion that forms my identity. And so, amidst all the voices and global resources of the Duke community, I am thankful for every invitation to know and be truly known. These past four years have taught me to value authenticity over ability; to ask good questions by listening for nuance; to reconcile different POVs with humble curiosity; to fortify my capacity for empathy and action with self-care; and to continually discern Why I do what I do in this lifelong dance with truth and grace. I attended my first documentary film festival this month, and it felt like home. Like home, Full Frame pulsed with the lifeblood of kindred storytellers. And like home, Full Frame required immense physical and emotional stamina to fully engage with the humanity of each story. Cameraperson, the (kinda meta) memoir of director-cinematographer Kirsten Johnson, is the story of a life dedicated to telling stories. I resonated so deeply with each scene that, by the end, I had added "Find an artist I trust to tell my story" to my bucket list. Yet her memoir also left me with the question, "What is the line between sharing a story with compassion and actually doing something within my power to improve the subject's life?" The same tension arose in me when I watched Speaking Is Difficult, a short by AJ Schnack that juxtaposes everyday scenes of towns affected by mass shootings with the initial 9-1-1 calls. As each new town (including Newtown, CT) appeared onscreen, I felt myself become more desensitized, to my chagrin. In Schnack's words, during "a film where the events themselves become this nonstop echo of each other," my unconcealed anguish in the first minute paled to a grey shiver of resignation in only fifteen minutes. When we witness injustice in an up-close-and-personal way – like if we’re personally oppressed or we’re in close relationship with a person who is oppressed – we tend to open the floodgates of compassion toward the one or few individuals with whom we have a personal connection. But when we witness an injustice from a distance, and this injustice affects masses of people (e.g., police brutality towards black people, the oppression of the Palestinians, etc.) we are easily overwhelmed by the sheer numbers. Rather than fortifying our compassion in response to such need, our compassion collapses and we disengage into hopelessness. But when we are intimately connected to systemic pain and tragedy, either personally or through close relationships, we are often able to respond with compassion and hope. During the fifteen minutes of Speaking Is Difficult, my compassion collapsed, and I disengaged into hopelessness. Even while being actively aware of it. Stalin was savage, but he understood the limits of human empathy. With this concern in mind, I want to share a profound reflection by Wesley Hogan, Director of the Center for Documentary Studies at Duke (Full Frame program, page 2). I intend to read it often, especially when I'm trapped in the hard questions, because it reminds me why I do what I do. Most of the stories told throughout human history, writer Julius Lester has said, were spoken into the darkness, around a fire with a vast impenetrable night surrounding teller and listeners. Then as now, stories aren't created from thin air; they already exist, as Lester so evocatively describes, "singing in our genes and in our blood." And stories, especially now, help us to learn that we can be thrown into a fiery furnace and not be consumed. Through stories, Lester says, "I learned that I could withstand the heat and flames and walk out of the furnace, strutting." In order to be seen, stories have to be retrieved from the darkness. The light of film can do this. Documentary, at its best, gives us stories that empower us to not only strut, but also to behold. Whether they illuminate great challenges and triumphs, or share simple observations of daily life, documentarians give us fresh eyes. To see clearly. To see critically, and skeptically. To see from multiple perspectives. To perceive with all of our senses. Documentary reminds us that even amidst a surge of forces vying for our attention in a culture of accelerating change, we can behold, be contemplative. Be deliberate. As such, for me, Full Frame feels like a shining gift - a gathering of those who share this desire to reflect. The alchemy forged so brilliantly by the Full Frame staff makes each filmmaker, story, and audience member important - and each space in which we consider a new story, sacred. In offering us these moments to listen, to slow down, independent documentarians serve as vital public servants, inviting participation in an important public commons for small-d democratic dialogue. There is an ebb and flow of nationalist politics in the United States, and lately we've been encountering the flow. There are some who insist that immigrants must learn to live like "Americans." That there must be one nation, one language, one uniform way of being. They would ask us to believe that difference is dangerous, and that we must practice exclusion, a mindset that runs counter to even the briefest consideration of our own experiences. As documentary so clearly reveals, we benefit when we acknowledge the value and validity of the diverse inheritances that each of us embody. For of course none of us possess and maintain a singular identity over a lifetime. We all inherit and inhabit a variety of selves whose definitions are in constant flux. Documentary allows a space for our multi-vocal, fluid selves to emerge. And so I invite you to immerse yourself in a collection of diverse inheritances this weekend. As Henry David Thoreau noted long ago, only that day dawns to which we are awake. In Durham, at Full Frame, as the theater doors open and beckon, each person we get to know, each subject we explore, each conversation we have, and each film we watch calls forth another story brought in from the shadows and lets us behold the marvelous complexity of our lives. Thank you for enlivening the festival with your vitality and wakefulness. Confession: I love my classes! Every single one of them. Granted, I'm probably wearing rose-tinted glasses since I'm only two weeks in to senior year...but altogether they are helping me develop a vocabulary for my artistic vision, compass, and trajectory. I'm learning how to tell the story that I am living, and it feels really good. This post is dedicated to why I value each class and the driving questions they're helping me answer. A space to discern the story I want to tell, to practice, and to share my own story. Already, I have gained some clarity about my values (e.g. being real, team art) through our Show & Tell exercise: share 30 minutes of original or inspiring media. I also can't get enough of our first reading assignment (this and this by Errol Morris), which likens the filmmaker to the brain, as both integrate different views into a meaningful narrative. What's more, our weekly homework assignment is to BLOG our creative process and thoughts. Perfect, right? I'm very thankful for this unexpected source of accountability to keep writing and reflecting. Look out for those posts under #capstone! What defines influential documentary? How do films successfully effect real-world change (policy, attitudes, and actions)? What can I learn and apply to my own decisions as a filmmaker who wants to share impactful stories? I'll be looking for answers to these questions as we watch documentaries on a wide range of topics: national identity, activism, racism, mental health, capital punishment, government accountability...yup, I can't wait! How do I identify and deeply understand my audience (the consumer)? How do I do communications research? What makes effective brand strategy, and how do I want to brand myself? I think our projects and discussion are mostly contextualized to product brand management, but the principles definitely apply to anything I want to communicate. How does education develop leaders? What kind of leaders does education need? What kind of leader am I? Where can/should I lead? I really love the readings we've discussed so far, and I feel myself applying the principles and ethics I've read about to my leadership roles on campus, as well as my college education. Of the three purposes of education I read about recently, I reckon I approach my education from a democratic equality perspective because I'm interested in classes and experiences that shape me into a conscious citizen who thinks critically and creatively (the purported aim of liberal arts, anyway). So I actually dropped the class after the first week because of schedule constraints, but as someone who's physically uncoordinated and theatrically untrained, I loved the push to know my body - not to fear or be ashamed of it, but to be in touch with it and learn to control what I communicate with my voice and body language. Hopefully another opportunity like this will open up in the future! And that's my academic lineup for this semester! Feeling quite in line with Duke's motto, Knowledge and Religion. My goal is to faithfully discern the stories I want to tell beyond Duke professionally, and I think my classes will support my discovery. I've definitely grown the most outside of my classes in general, so it's refreshing to be this excited and expectant for the classroom! Photo taken at the Mr. Brainwash Pop-Up Gallery in NYC.